After my husband and I made the decision to move from the suburbs of Chicago to Knoxville, Tennessee, we thought renting for a year would be a better choice because we looked at more than 20 homes to buy yet never came up with quite what we wanted. Plus, we don’t know the area AT ALL, and we didn’t want to rush into buying just any old house in any old place. In another post, I’ll talk more about the decision to downsize from our 3000 square foot home to an 1121 square foot apartment, but for this story here’s what you need to know: in that process, we realized our daughters, ages 10 and 13, would have to share a bedroom in our new 2-bedroom apartment. 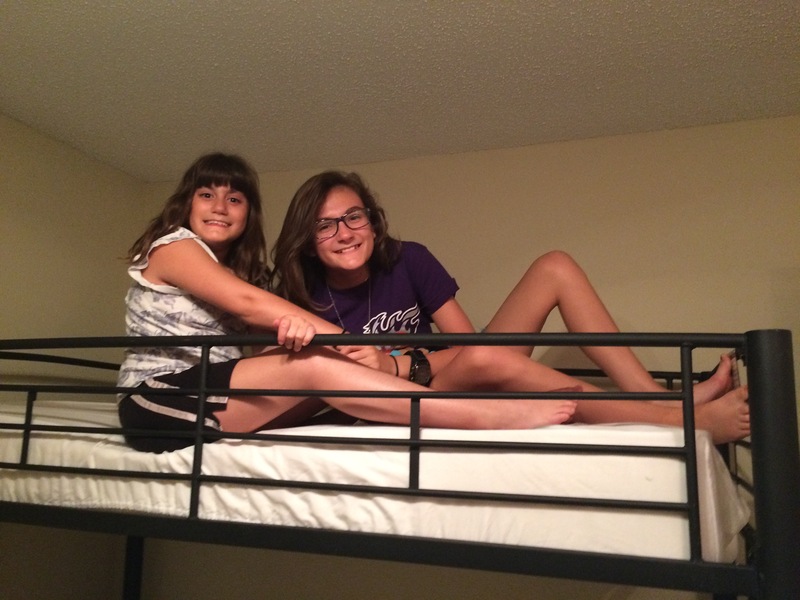 I suggested the girls might enjoy bunk beds, and they were both elated to have that experience. So I set to work on finding some gently used bunk beds for sale at sites like Craigslist, Bookoo, and OfferUp. I soon negotiated a good deal on a set for sale near our former home that I really liked because the lower bunk is a full-sized bed, which allowed a few more options. When we picked up the black metal frame of the bed, it was in parts. That’s when my Dad took over. You should know my Dad is the handiest of handy men, the most intense assembler you’ll ever meet, and a complete perfectionist when it comes to doing any project he undertakes, no matter how long it takes to get it done right. If you’ve ever seen the HGTV cable network star contractor, Mike Holmes, who makes EVERY thing perfect about a project, you have an idea of how my Dad tackles a project. Plus, he’s retired now and has FULL TIME to devote to any pursuit he wants. And in this instance it was all about the bunk beds. Once he was involved, Dad went online and printed not one, but two full sets of directions to assemble the set. Then he took the whole bed completely apart so it would fit on the moving truck. He labelled all the little screws, nuts, bolts, and pieces that were part of the assembly of the bed, organized them by what part of the bed they came from into little plastic bags, and then put those into a bigger plastic bag. Finally he packed the whole lot into a well-marked cardboard box and sealed it up. When we arrived at our new home, for the first couple of weeks one girl slept on the twin-sized sofabed and the other slept on her mattress on the floor because my Dad wanted to be the one to put the beds together the RIGHT way and had planned to come down the second week we were in Tennessee. He’s great at assembling anything and loves it, plus we had plenty of other tasks to do before my parents arrived (have you seen the photo of Box Mountain in my dining area?! ), so we came across the well-marked box, and put it into a very safe place. When the day came for Dad to put the bunk beds together, we started looking for the well-marked box with all the nuts and bolts and pieces neatly organized inside. The well-marked box was about the size of a shirt box at Christmas, but double the thickness, so it wasn’t a massive moving box, but plenty substantial that it could easily be noticed. But nobody could find the well-marked box ANYWHERE. We looked all over the apartment, which was easy enough because there are only two bedrooms with walk-in closets, the main living space, and the kitchen/dining area. No well-marked box. I recalled having the box in my hands and placing it into the girls’ bedroom in the stack of other boxes in there, but as we organized their room and closest, emptying moving box after moving box, the one well-marked box we needed to find to make their beds was not among them. My husband saw the well-marked box a handful of times, too. He ran back and forth to the storage area (I couldn’t part with my dining room table, our Christmas decorations, and some much-loved bigger furniture pieces! ), and he could never find the well-marked box. My mother-in-law and father-in-law, who live near us here in Tennessee had been helping us unload and unpack. My mother-in-law remembered seeing the well-marked box, but wasn’t sure where it was, either. After several DAYS of searching off and on for that well-marked box, my Dad and my husband finally decided that we needed a Plan B. We called the manufacturer and explained our situation, hoping they would sell us just the parts, but that wasn’t going to work. So we ended on Plan C: Buy a new set of identical bunk beds to the set we already had and start fresh. Now, being a thrifty sort who isn’t quite a conservationist, but hates throwing things away that can be used, that really upset me. We had all the BIG pieces for the bed, it was just those screws, nuts and bolts. I knew we would someday come across that well-marked box, so I thought at the very least I could re-sell the whole original set so it could go to a home that would use it. While my Dad and husband were at the store, buying the new bunk beds, I said a prayer to St. Anthony (the saint of lost things), and suddenly I had a revelation. It wasn’t the well-marked box we needed AT ALL. It was the stuff INSIDE that mattered. Suddenly, with a new determination — and NOT looking for a BOX, but instead looking for the actual thing we needed — I FOUND IT within 2 minutes. Where was it? In the girls’ room, right next to the parts of the bed. What we needed had been removed from the well-marked box, which had apparently long been discarded, so instead it was a plastic bag filled with other plastic bags in which all the pieces were! All along we had been looking for a BOX, when what we wanted was what was inside the box, and ignored everything else. We probably each looked right past the set of plastic bags a half dozen times each. What a relief to finally find what we needed! Sometimes we THINK we want the box because the magic, we’ve been told, is right inside that particular box. All we have to do is open it. But instead of seeking the magic itself, we seek the box. Put into concrete terms related to business, we want what goes with a successful business: the credibility, the clients, the cash, the freedom… but instead of working for those things, we spend a ton of time worrying far too much about the box we THINK those things are inside such as a perfect website, a finished information product, a book fully written and published, and so on. You CAN achieve what you want, without worrying about the box. In life, too many people wait to go after their dream job or search for the person they want to enjoy the rest of their lives with because they are stuck looking for the perfect box of making their body perfect, or their resume perfect, or their wardrobe perfect. You can reach those personal goals, without worrying about the box. My friends, keep your eye on the prize. It’s not about the box at all, no matter how well-marked and how certain you are you will find it one day. Seek what is inside. Go for what you REALLY want. great story and great point, Felicia, thank you. Glad you enjoyed it, Kerry, and thanks for visiting!